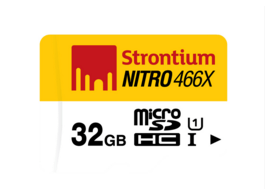 Askmebazaar brings you the Life amplifying deal your the new you, Buy Strontium 32GB Nitro MicroSDHC Memory Card (Class 10) at Rs.552 only + 15% Additional discount (Effective Price Rs.469 only). This is the lowest price deal present for this product. Moreover, Pay online using Mobikwik & get 10% Cashback (Upto Rs.100) or pay online using any mode to get 5% off. Stocks are limited. So Hurry & Grab this offer now. Enjoy the deal & Discount! High-speed mode : variable clock rate 0-50MHz, up to 10MB/sec interface speed. Get 10% cashback on AskMeBazaar and AskMeGrocery when you pay through MobiKwik. Maximum MobiKwik cashback is Rs. 100. Offer is valid till 31st March, 2016. Offer is valid on both AskMeBazaar and AskMeGrocery.